Jennifer is shown holding the prestigious "Dispensing Optician of the Year 2013" award she won in a poll organised by the Association of Optometrists by receiving thousands of internet votes. 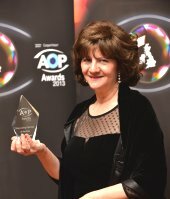 Jennifer is the Optician Magazine's first ever winner of the much coveted "Outstanding Dispensing Optician of the Year" award and is the winner of the Association of Optometrists "Dispensing Optician of the Year 2013"the only person to have won both awards. Jennifer has appeared in a film with English TV journalist Daisy McAndrew, explaining how partially sighted people can improve their ability to cope with daily living tasks by the use of low vision aids. Click on the link below to view the film completely free. Stylish REFLECTIONS sunglasses plano at £39.95 and to your own prescription from £99.95 complete to include frame, lenses and tint. Also with bifocals and varifocals. Are you having trouble finding your favourite contact lens solutions? Click the solutions button to have them sent direct. D & J Brower opticians regularly update this web site to keep you informed about topical items and money saving promotions. Are you seeing well enough to drive? Is there a way of seeing better for driving at night? Find out by clicking on the button below. You can now view a range of tinted overspecs which can be worn over your own glasses just by clicking the overspecs button.